A four image montage of the first butterflies and one of dozens of bumblebees enjoying the pollen on purple coneflowers and Bee Balm. 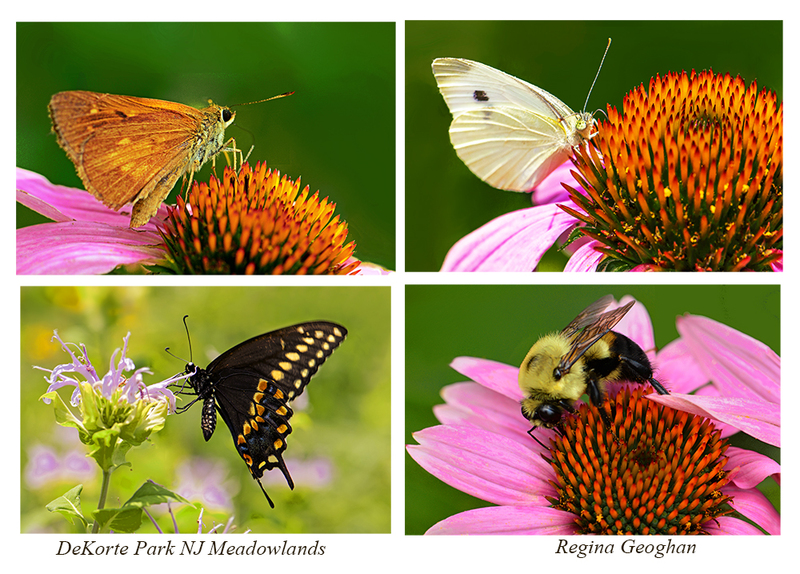 Thanks to Regina Geoghan for this collage of beautiful butterflies and bees seen recently at DeKorte Park! Don’t forget to register for Butterfly Day on Sunday, July 29 at the park. The family-friendly, free event runs from 10 am to 3 pm and includes butterfly walks, talks, onsite experts to help identify the various butterflies and kids activities including a Scavenger Hunt, Face Painting, Butterfly costume contest (12 and under) and crafts. The butterfly festival is co-sponsored by the Bergen County Audubon Society.